I didn't really know what to expect from The Nightmare Affair. I knew it was going to be a mystery, but I didn't know how good it was really going to be. The worst thing that can happen to a mystery novel is when the reader can guess the ending and get it right. I kept guessing, but I didn't get close to being right. This novel has so many twists and turns it will definitely keep you reading. I have to give a small mention about the cover, because it is absolutely beautiful. I love when covers are artistic and mysterious. I don't like cover models so I love that it is a shadow person. Very well done and definitely a big part on why I requested this novel. I really liked the idea of a Nightmare. I never thought about this type of gift and so it was a very interesting read. Definitely something very unique and an area that hasn't been explored. I also really liked that it took place at a special school for people who are paranormally gifted. It reminded me, a little, of Harry Potter. I really love the idea of a school being for special kids. It gives readers a whole different world and experience to explore. As for the characters, I loved them. I loved Dusty. She was such a cool, misunderstood chick and I absolutely loved her named. You go Mindee for thinking up such a creative name. I love names that are totally out of the box. I also really, really loved Eli. I was rooting for him the entire time. My third favorite character was definitely Dusty's siren best friend. I loved her Siren's are too stereotypical attitude. This was definitely a very different and unique book and I really loved the adventure. There really isn't another story that you could pinpoint and compare it to, because it definitely one of a kind. Really great story and I highly suggest readers to check it out. 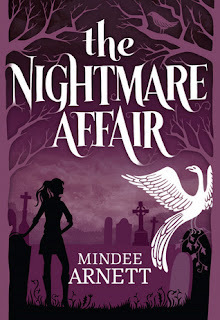 I really loved The Nightmare Affair. This is a very unique and new topic of Nightmares and I think it was very well done. I loved all of the characters and I especially loved Eli's character. The plot of the story was very good and I liked that there were so many twists and turns. I hate when you can solve mysteries before the end and I didn't figure out the bad guy until the characters did, so it was great and well planned. I absolutely loved the cover. It played a very key role on why I decided to request this novel. Overall very well done book and I highly suggest everyone check it out.